Preheat the grill or barbecue. Mix together the mince, oregano, coriander, lemon zest and seasoning. Divide the mixture into 12 and squeeze around 12 skewers. To make the dip, mix the cucumber with the yogurt, garlic, mint, lemon juice and seasoning. Grill the lamb koftas for 10–12 minutes, turning occasionally until well browned and cooked through. 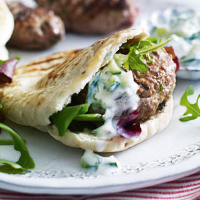 Serve the koftas in warm pittas with salad leaves and the mint dip. Soak the wooden skewers in water for 10 minutes to prevent them from burning. This is perfect with the freshest of rosés, but one with plenty of flavour. Try this selection well-chilled for a summer treat: Chat-en-Oeuf Rosé, Pays d’Oc, South of France. This recipe was first published in August 2010.